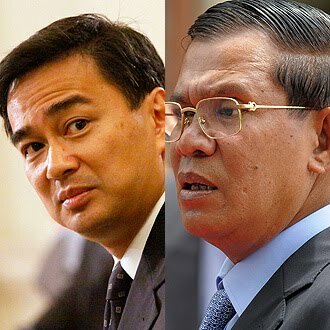 Thailand’s parliament is set to approve the latest round of border negotiations with Cambodia, a move that could bring the neighbours closer to resolving long-standing differences over their shared boundary. Minister Abhisit Vejjajiva told a delegation of visiting Cambodian journalists in Bangkok that debate on the minutes of three Joint Border Committee meetings would likely open at the Thai parliament next Tuesday. Affairs deputy spokesman Thani Thongphakdi said. area in a bid to ease tensions. At least seven soldiers have been killed in clashes in the area since 2008.
temple would yield a swift resolution of the countries’ disagreements. Thani cautioned that the approval could be delayed depending on other business facing Thai legislators. outstanding issues before we get to this particular issue,” he said. “I cannot give any predictions now, but if they approve, then we will look into the issue and work together,” Var Kimhong said. Shinawatra from his advisory position with the Cambodian government.